Kate Young is a Scottish singer, fiddle player and composer. Kate explores the combination of voice with her fiddle-playing whilst applying knowledge of world traditions with her own compositions. She was brought up immersed in the folk music scene in Edinburgh, learning about Scottish traditional music, later going on to graduate from Newcastle University’s BMus in Folk and Traditional Music Honors Degree with a First in Voice and Fiddle performance. Kate is part of all-woman project Songs of Separation (currently nominated twice in BBC Radio 2 Folk Awards 2017 for Album and Traditional Track of the Year). 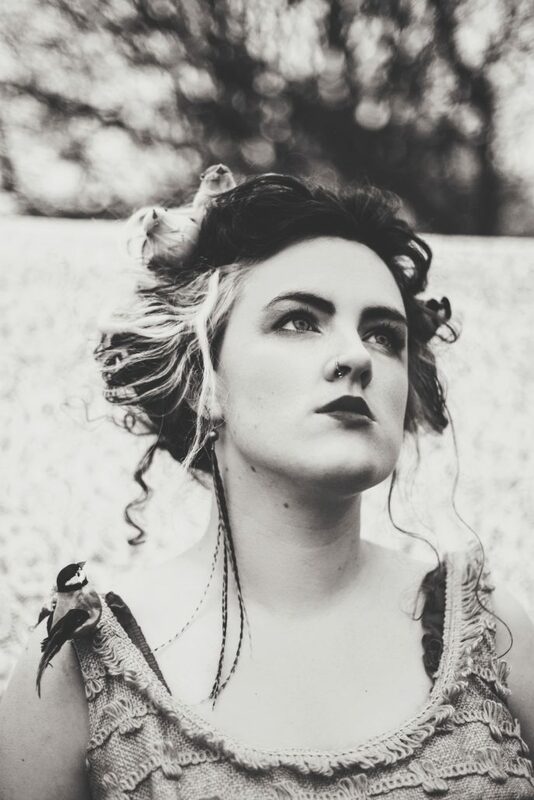 She is also part fo the four-piece fiddle-singers quartet Carthy, Oates, Farrell & Young with Eliza Carthy MBE. Her own project, Kate in the Kettle released their debut album Swimmings of the Head in 2014 which encompasses an array of songs and tune sets – many of which combine different traditional music sources with self-penned works (**** Songlines Magazine “a daring album which announces a new major British talent”;**** The Guardian, **** “enthralling” MOJO Magazine). In 2016 Kate was commissioned to work on the prestidious ‘New Voices’ show by Celtic Connections. With this, she delved deep into her fascination with the history of folklore surround the human relationship with plants and plant-medicine. This appears to be a dying knowledge and tradition in many countries and particularly in Scotland as it is relatively obscure and unknown. However, with research of Scottish archive recordings and reading about various British herbalists, Kate chose to bring to life some small anecdotes attached to plant uses by turning them into song, and combining this with the setting of string quartet, drums, doublebass and harp. (**** The Scotsman). She has also worked with Mr McFall’s Chamber and Northern Sinfonia Quartet over the past seven years. Kate will release a new duo album in June this year with French diatonic accordionist, Raphaël Decoster called ‘les objets trouvé’. Check www.kateyoungmusic.com for tour dates.